When they get their hands on a shotgun, criminals tend to use cheap birdshot. They think: a 12 gauge shotgun shell is a 12 gauge shotgun shell, right? Wrong! 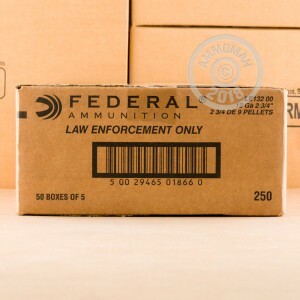 This case of 250 shells from Federal comes with several features that make it more effective for the law enforcement purposes it was designed for. The 9 pellets in each 2 3/4" shell are copper-plated for better shape and energy retention, which translates into more consistent patterns for taking down threats of the animal or criminal variety. Federal's FLITECONTROL wad keeps the pellets together even after they leave the barrel, gradually releasing them several feet later for improved medium-range effectiveness. The load's reduced recoil comes at a slight cost in muzzle velocity compared with "express" hunting loads, but enables quicker follow-up shots and use by recoil-sensitive shooters. The reduced velocity also aids in preventing overpenetration and collateral damage, an important feature even for shotguns in a self-defense context. Overall, this is an excellent, balanced shell for your home defense shotgun. Grab $99 or more from AmmoMan.com to qualify for free shipping direct to your door! Very happy with this transaction. Great work. Got exactly what I ordered, in the timeframe stated. No issues with quality, would definitely buy from Ammoman again. This is a great product for home defense! I intend to purchase more when my budget allows. I have not shot any of these shells because they are for my home defense. 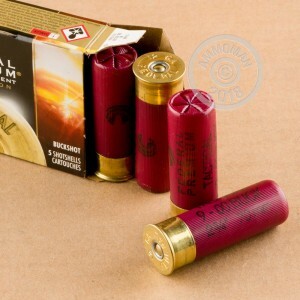 I use other shells I have purchased from Ammo man for target practice. I have been very pleased with all of my purchases & will definitely purchase again & recommend Ammo Man to others! 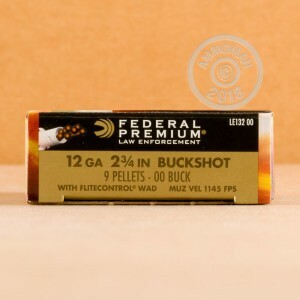 This is the best buckshot ammo money will buy. No fliers... tight patterns. Extends the range of 12 gage for serious purposes. This load, LE132 00 with nine pellets is better than the eight pellet load based on performance during my shooting. The LE132 000 eight pellet load works even better for longer shots. I teach CCW classes and often demonstrate this ammo... most impressed students ever. Cannot believe how far before the pattern starts to open and how far from the target we get still able to keep all pellets in the head of a B27 target. Some shotguns can keep all nine pellets within the 8-ring of a B27 target at 50 yards! I buy LE 132 00 by the case two or three times a year from AMMOMAN... great service, always exactly what I order. Best price when you consider the free shipping. About to order another case. Sometimes this Federal ammo is not available for six months at a time so I try to keep at least a case in reserve. AMMOMAN is a joy to work with... every time! Takes one week from the day I order to receive it in central California. I've shot this excellent ammo on the range and my large metropolitan PD uses it in all our shotguns. It is designed to hold a tighter pattern to a longer distance using flitecontrol. It is very accurate.